CLASSIC/COMEDY. Three traveling minstrels arrive at a town where everyone hates minstrels. With nothing but their own shoes to eat, the minstrels have to come up with a story entertaining enough to earn their supper. The minstrels decide to tell the villagers the story of an aging donkey, dog, cat, and rooster who run away from their masters and head to the Town of Bremen to become famous singers and musicians. Along the way, the animals encounter a tiny house hidden in the woods where a band of dimwitted thieves are hiding out with piles of stolen treasure and an abundance of food. With their “beautiful” singing voices, the animals manage to scare off the thieves, enjoy a grand meal, and live out their lives happily ever after. 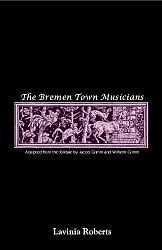 Audiences of all ages will adore this humorous version of the classic tale by Jacob and Wilhelm Grimm. Lavinia Roberts is the author of several published plays and has acted, directed, and crewed in community, college, and professional theatres in the United States and Europe. She earned a BFA in Fine Art from the University of Kansas and teaches children’s acting classes at the Topeka Civic Theatre and Academy in Topeka, Kansas.